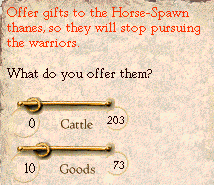 The temporary Horse-Spawn weaponthanes are now permanent, proper Orlanthi weaponthanes! 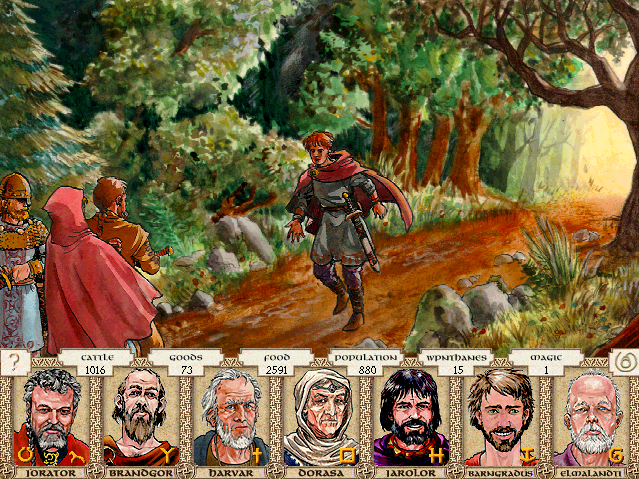 Your explorers encounter a woman from Heortland while mapping the south. Her name is Alarandra, and she is fleeing from her homeland. "I slew an agent of the Pharoah, who sought to tell chosen Orlanthi chieftains how to properly interpret the laws of our people. Although my act was just, and supported by the spirits of our ancestors, the leaders were too afraid of the Pharoah to stand up for what is right. They outlawed me, and sent pursuers to kill me. I think I have outdistanced my pursuers, but would be lying if I said I was sure of that." The explorers were moved by her words, and brought her here, suggesting that you should give her asylum. -Adopt her as a weaponthane in the chief's household. -Adopt her as a weaponthane. -Give her hospitality, then see her on her way. 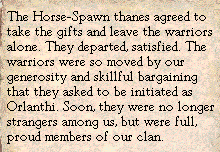 If we make the wrong decision, the already-fragile harmony of the clan will be disrupted. Give her ten cows worth of easily-portable trade goods. By all means, adopt her, and honor her as a great foe of the hated Pharaoh. Why do we think it honorable that she killed, instead of finding a new kind of peace? Do we really need another weaponthane? She fought against the Evil Ruler, and deserves our gratitude.